Easily one of the most recognizable aircrafts of the Second World War is the twin-engine C-47 transport plane. In both the European and Pacific theaters, the C-47 Dakota was pivotal to the success of innumerable missions of the Western Allies, and General Dwight D. Eisenhowever, Supreme Commander of Allied Forces in Europe, called it one of the most vital pieces of military equipment in the war. Although the Soviet Union did fly several U.S.-built C-47 Dakotas, the vast majority of transport aircraft used by the Soviet military were Lisunov Li-2s, license-built versions of the C-47. While similar in form and function to the Dakota, the Li-2 was modified to fit the needs of the Soviet forces on the Eastern Front, which in turn made the license-built aircraft capable of carrying out tasks that its Western counterpart could not. In June of 1936, the head of the Soviet Central Aerohydrodynamic Institute (TsAGI), N.M. Kharlamov, reached an agreement with the Douglas Aircraft Company to purchase one of the California aircraft manufacturer’s latest fixed-wing, twin-engine commercial aircraft, the DC-3 (which later had the military designation C-47), for $130,000. More significantly for the development of the Soviet aviation industry as a whole, the TsAGI purchased a license to build their own aircraft based on the DC-3 for $207,500, complete with blueprints, technical support, and manufacturing guidance from Douglas. Per the terms of the contract, a Soviet delegation, which included aeronautical engineers Boris Lisunov and Vladimir Myasischev, traveled to the Douglas plant in Santa Monica, CA, where they learned not only how to produce DC-3s, but how to run an efficient and cost-effective aircraft manufacturing facility. Before the Soviet Union could manufacturer such aircraft, however, several important steps needed to be taken, including the translation of Douglas’ technical documents from English to Russian, and, more significantly, the conversion of the U.S. company’s imperial measurements to the Soviet Union’s metric system, a task which took six months. Meanwhile, as engineers were preparing the technical documents for the production of the twin-engine aircraft, the Soviet Union purchased an additional 18 DC-3s from Douglas, and Soviet authorities began to prepare aircraft factory no. 84 in Khimki, just outside Moscow, to be the production site for the aircraft. Vladimir Myasischev, who had visited the Douglas plant in California, was to head the project in Khimki. Though Soviet engineers initially hoped to incorporate as few changes as possible to thedesign of the DC-3, by the time the first aircraft made with imported parts rolled out of factory no.84 in November of 1938, almost 1,300 engineering changes had been made to the original Douglas drawings. In addition to converting the measurements from the imperial to the metric system, no small task on its own, numerous modifications had to be executed in order for the aircraft to be able to house the Soviet-built Shvetsov ASh-62 engines, which were a development of the Wright R-1820 Cyclone that had initially been built in the Soviet Union under licence as the Shvetsov M-25. Nevertheless, after a series of trials and errors, the new aircraft passed government tests in 1939, and was designated PS-84 (Passazhirskiy Samolyot 84, or passenger aircraft 84). 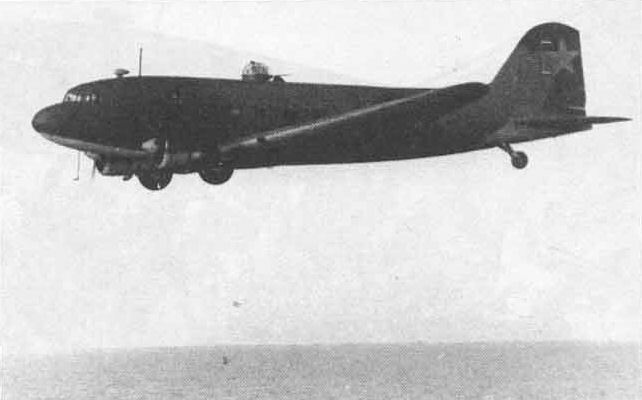 The new Soviet-built PS-84 entered commercial service in the summer of 1940. By this time, Aeroflot, the Soviet Civil Air Fleet, had 12 U.S.-built DC-3s in their service, which were used primarily for international flights, and the PS-84s were to be used for longer domestic routes, such as the Moscow-Irkutsk line. Over the next year, factory no. 84 increased its efficiency by leaps and bounds, in part due to the help that had been provided by the Douglas company since 1936, and by October of 1941, four months after the German invasion, aircraft production in Khimki reached its pinnacle, producing 1.5 PS-84s per day. However, due to the Wehrmacht’s rapid advance toward Moscow, the Soviet military leadership, seeing the importance of the PS-84 transport aircraft, put factory no. 84 at the top of the list of aviation factories to be evacuated to the Soviet East. A herculean undertaking even in times of peace, in a period of only two months, the PS-84 factory outside Moscow was successfully evacuated to Tashkent, Uzbekistan. The last factory no. 84 aircraft rolled off the assembly line on October 18th, 1941, and the first Tashkent PS-84 was completed less than three months later on January 7th, 1942. The PS-84s that were produced in Tashkent, however, varied significantly from those that were built in Khimki during the first few months of the war. The Soviet military, receiving aircraft that were designed to carry civilian passengers in comfort, transformed the aircraft to fit the needs of the Eastern Front. As one Soviet technician, Nikolai Sharapov, recalled, “The factory in Tashkent transformed it, the Li-2 [PS-84] aircraft. Lisunov was the chief engineer. He redesigned it… he removed the soft seats… he made the seats of folding metal. He also created another large door: in addition to the passenger door there was added a cargo door. A turret was also added to these plans… and ShKAS machine guns.” Indeed, Soviet ground crews had begun undertaking significant field modifications to the PS-84 as early as September of 1941 in order to make the commercial aircraft more suited for military tasks on the Eastern Front. In particular, due to the fact that 18 of the 51 PS-84s in the Moscow sector had been lost by August, Soviet technicians sought to bolster the defensive capabilities of the converted passenger planes by installing a dorsal turret armed with a 7.62mm ShKAS machine gun and two additional machine guns in the waist of the aircraft. The field modifications undertaken in the autumn of 1941 were incorporated into the production plans at the Tashkent factory in early 1942, with the dorsal turret being upgraded to house a 12.7mm UBT machine gun. Upon relocation of the factory, the aircraft itself received a new designation: the Li-2, named after Boris Lisunov who had taken over as head of the project. “It came [from the factory in Tashkent] as a bomber,” Li-2 pilot Nikolai Syshchikov recalled. “All planes had a high-caliber UBT [12.7mm] in the turret, and two ShKAS [7.62 mm] on the sides. At first there was a nose gun, but then it was removed- it was not necessary, it was not a fighter! The plane was too heavy to roll, to chase and catch [another aircraft] in its sights, so the fixed machine gun was simply removed.” Indeed, even without the nose gun, the single UBT and two ShKAS’ affected the aircraft’s performance, decreasing its top speed by as much as 14-17 km/hr and significantly reducing its range and rate of climb. Nevertheless, Soviet airmen were willing to trade performance for armament, and Li-2s continued to be manufactured with the three machine guns until production of the military variant of the aircraft ceased. The PS-84/Li-2 was used primarily as a transport aircraft during the first year of the war, but from the summer of 1942 onwards, it was adapted to to serve as a bomber. By installing hardpoints under the fuselage, the Li-2 was able to carry up to four 250 kg bombs, which were released by the navigator who used a primitive bomb sight set up along the right window. To increase the payload, Li-2 crew members often loaded smaller bombs into the cabin of the aircraft, which they would throw out of the back door while over enemy territory. The lack of accuracy during such missions convinced Soviet military officials to to use the Li-2s as night bombers, as such campaigns did not require precise accuracy. Indeed, the license-built DC-3s were used extensively as night bombers in November and December of 1942 during the Battle of Stalingrad, during which time Soviet forces held only a small strip of land along the west bank of the Volga River. Li-2 bombers would simply fly over the German-occupied territory of Stalingrad, drop their bombs, and return to their airfield to rearm. Soviet authorities continued to put emphasis on Li-2 production until the end of the war. After the first Li-2 rolled off the assembly line in Tashkent in January of 1942, a further 422 were produced that year, with production increasing to 618 in 1943 and peaking at 627 in 1944. 458 were built in 1945, but production tailed off considerably after Germany surrendered in May. Commercial Li-2s continued to be built until 1954, and they saw extensive use in the Soviet satellite states through the 1960s. In total, more than 6,000 Li-2s were built, both for military and commercial purposes. Much like its cousin, the C-47, the Li-2 was a workhorse, known for its toughness and dependability. However, the Soviet-built version was heavily modified to carry out tasks unique to the Eastern Front, and was thus more versatile than the Douglas aircraft, which itself was an extremely functional aircraft. Nevertheless, both the C-47 and Li-2 deserve to be remembered as the workhorses that operated tirelessly behind the scenes to ensure the success of the allied operations that led to the defeat of Germany and Japan.